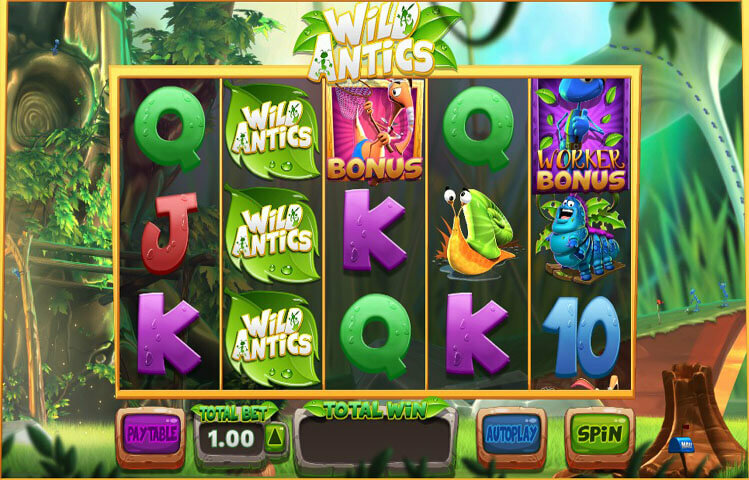 Players jump into the wild jungle when they take a chance on the Wild Antics online slot. This cartoon inspired microgaming slot features the adventures of Adam who lives an ant life as a worker. Every symbol is colorful and animated including the A, J, K, Q, and 10. Bonuses come in plenty with this cute little slot. There are wild cards, free spins, and scatter symbols to be found. Players have many ways to earn free spins in this game. If they spin two pictures of Aardvarks on the first and second reels in combination with a bonus symbol on the fifth reel they can win free spins. If two bonus symbols appear on any two reels from one to four the little worker ant pops up out of the tree trunk on the lower right hand of the screen and a bonus re-spin appears in the fifth slot. If a giant soldier ant appears on that reel during this spin a bunch of little worker ants jump out of the tree trunk and start to carry off the entire slot. They walk it toward the right-hand side of the screen and after they put it down they jump back through a different tree trunk on that side. A new screen appears over the reels explaining the amount of free spins won. During the free spin rounds the soldier ant will appear as the Wild symbol and will bounce around until it lands on the fifth wheel with the second one landing on the first reel. Each free spin that the wild symbol appears the player keeps that symbol on the screen for the duration of the free spins. The wild symbols that are kept will bounce around to different reels during each spin. If the wild symbol bounces around and lands on top of another wild symbol it becomes a multiplier. The picture on the screen changes to a worker ant standing on top of an Aardvark when the free spins have finished. This little worker ant jumps up and down on the aardvark to push the gold coins out of him. During game play any spin with just two lonely little ladybugs with a wild symbol will win the player money. A giant green leaf with the words Wild Antics on it will gain the player some cash if they can spin one of those pictures on more than one reel. Of course, spinning three of any of the cartoon characters across the reels will also bring in some money. During a bonus round players will see three flying ants appear with the screen telling the player to pick one. The player will pick one to reveal which bonus round is coming next. If an ant reveals Aardvark Antics the reels will keep spinning until the snout of the aardvark stops one of them by suctioning up the ant at the bottom of the screen. If the aardvark misses the ant the reel keeps going. Each time the aardvark catches the ant it reveals a wild down that reel. The worker ant is again bouncing on the belly of the aardvark as it ejects gold coins into the air.